demands of running your own store – whether it’s online, offline or both. Retail Minded Magazine is the only trade publication dedicated to the entire lifestyle of owning your own, small retail business. Delivering NEWS, EDUCATION & SUPPORT for independent business owners of all kinds, Retail Minded offers practical solutions, expert advice and realistic insight to the daily demands of running your own store – whether it’s online, offline or both. 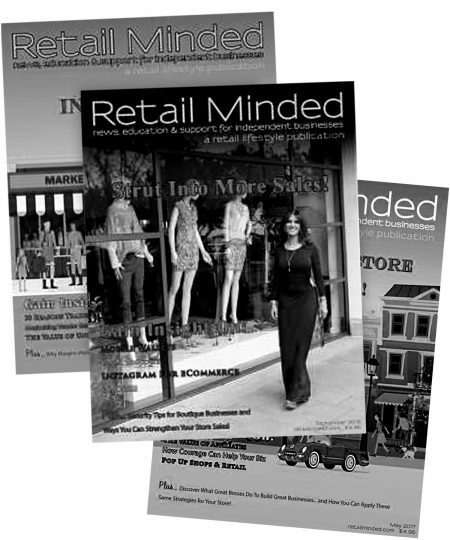 Each issue of Retail Minded delivers news on inspiring merchants, industry trends, tips to managing your business, affordable marketing ideas and more. We don’t represent just one retail category, but instead represent the business of independent retail stores at large. Another perk? Like our readers, we are “indie” ourselves! New issues coming soon! Stay tuned for updated subscription info and digital download information.